DISCLAIMER: Although I do not subscribe to this belief, I believe it is noteworthy as Bigfoot Lore. 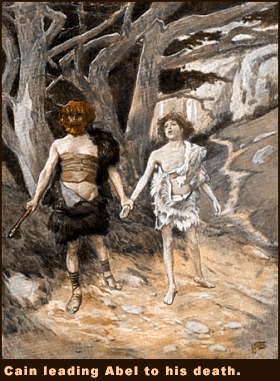 There is several pieces of Mormon literature claiming that Bigfoot is a modern incarnation of Cain, the brother and murderer of Abel, from the Bible story of Genesis. Here's a Cain/Abel refresher in case you haven't been attending Sunday school. The first children of Adam and Eve, born after the Fall of Man. Once, when they were grown men, both Cain and Abel offered sacrifices to God. When Cain saw that Abel's pleased God whereas his did not, Cain murdered his brother out of jealousy. For his crime, Cain was exiled by God to a life of wandering in a distant land. Most recently the BF/Cain connection was a research paper written by Matt Bowman and published in Journal of Mormon History. The paper is based on several sources including David Patten’s story of encountering Cain, a letter published in Lycurgus Wilson’s biography of Patten, Spencer Kimball's Miracle of Forgiveness, a poem referencing the event by Eliza R. Snow, and meeting records of Quorum of the 12. The biggest contribution to the lore Mr. Bowman provides is evidence the story was widely circulated in the 19th century. The paper goes on and cites Church Archives I finding similar stories; such as a page marked “from the papers of E. Wesley Smith,” mission president in Hawaii in the 1920s and brother of Joseph Fielding Smith, describing Wesley’s meeting with Cain, and explaining that his brother told him of David Patten’s encounter. "As I was riding along the road on my mule I suddenly noticed a very strange personage walking beside me.... His head was about even with my shoulders as I sat in my saddle. He wore no clothing, but was covered with hair. His skin was very dark. I asked him where he dwelt and he replied that he had no home, that he was a wanderer in the earth and traveled to and fro. He said he was a very miserable creature, that he had earnestly sought death during his sojourn upon the earth, but that he could not die, and his mission was to destroy the souls of men. Clan of Cain: The Genesis of Bigfoot is a newly published book that offers a different dimension to the Bigfoot mystery. A recently uncovered document reveals a possible connection between the origins of the Mormon Church (Church of Jesus Christ of Latter-Day Saints) and Bigfoot. Searching through the archives of historical church documents the author; Shane Lester uncovered an extraordinary story that becomes the foundation of a new theory about the origins of Bigfoot. There are a few more sensational press Bigfoot has recieved lately, which I will be posting in the next few days. Then I will get back to more serious stuff. Stay tuned for Bigfoot Endorses Clinton, and NASA:BIGFOOT IS A MARTIAN!